The report also delivers assessment on the global market for microalgae through a segmentation analysis in its following chapters. The market has been branched on the basis of sales channel, applications, product type, and region. These market segments have been scrutinized and analyzed based on a comparative study that involves revenues, market share, and Y-o-Y growth through the forecast period. Geographically, the global market for microalgae has been segmented into Latin America, Japan, North America, Europe, Asia-Pacific excluding Japan, and Middle East & Africa. Sought in both freshwater and marine environments, microalgae find extensive utilization as food as well as live feed in aquaculture. Gaining popularity as a promising nutrient source, microalgae impart high nutrition and comprise high-value compounds including pigments, fatty acids, and anti-oxidants. The market size and quantities of nutrients produced from microalgae, although being significantly smaller than various other commodity crops, outlook of demand for microalgae-based nutrients is expected to be impressive in the foreseeable future. In spite of various challenges such as climatic conditions, complex regulations of food authorities, and low consumer demand, the market for microalgae is likely to spur in the near future. This can be highly attributed to technological and scientific innovations and developments, along with the dominant position of microalgae in the agri-food market. Being rich source of fiber, enzymes, protein, and carbohydrates, microalgae have become a major source of food ingredients, particularly across Asia countries such as South Korea, and China. Biomass of microalgae is marketed in the form of liquid, capsules, and tablets, which are utilized as nutritional supplements. Microalgae also seek use as natural food colorants or supplements in pasta, drinks, or snack foods. Microalgae harvesting involves concentration of dilute suspensions of microalgae, and major techniques employed for harvesting and recovery of microalgae are filtration, flocculation and centrifugation. These techniques however have limitations associated with cost and energy demand, along with high processing time requirement. As amount of energy utilized in these processes is enormous, new companies face barriers in entering the market, while existing companies face difficulties in scaling up production. The situation aggravates further in case of small & medium-sized companies (SMEs). In a bid to resolve these challenges, new technologies that hold potential in curtailing cost of harvesting and recover are being developed by well-established firms through robust investments in research & development. Persistence Market Research has compiled a new report on the global microalgae market for the forecast period (2017-2026). The report projects the global market for microalgae to exhibit a moderate growth through 2026. Worldwide sales of microalgae are estimated to exceed US$ 75 Mn in revenues by 2026-end. North America has been slated to remain the most lucrative market for microalgae, mainly driven by technological vigour of the region in harvesting and extraction of microalgae. In addition, the pharmaceutical industry in the region has showcased a significant rise since the recent past. On account of microalgae’s composition of various high-value compounds, such as polysaccharides and polyunsaturated fatty acid, it seeks robust adoption in the pharmaceutical companies. Microalgae is also witnessing tremendous adoption in the region’s food industry as additives. Spirulina will continue to be the leading revenue contributing product in the global microalgae market. Spirulina is widely commercialized and employed as nutritional supplements in food. It also seeks tremendous adoption as animal feed additives. Spirulina is gaining worldwide popularity as one of the highly nutritious food supplement, as it is an excellent source of proteins, vitamins, and pigments. Revenues from global sales of spirulina are estimated to close in nearly US$ 40 Mn by 2026-end. Food and feed industry is expected to prevail as the leading application of microalgae, in terms of revenues as well as sales expansion. Microalgae are widely utilized for enhancing the nutritional value of food products and animal feed. Use of microalgae as a substitute for biodiesel feedstock has gained high interest among researchers and entrepreneurs. 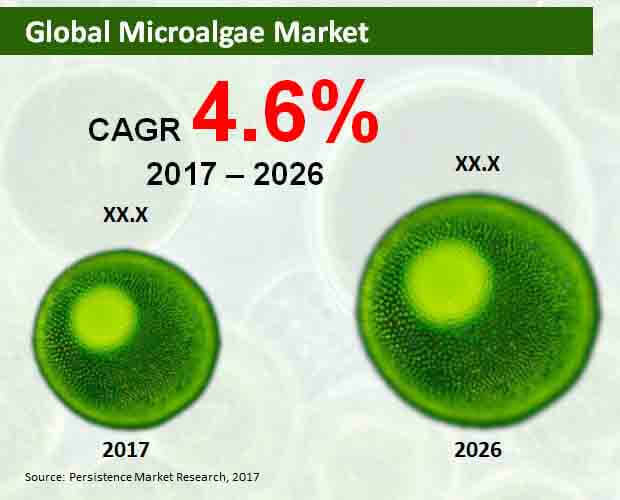 Retail stores and online stores are projected to endure as the fast expanding sales channel for microalgae, with sales collectively poised to exceed US$ 40 Mn in revenues by 2026-end. Cost-effective and more efficient technologies are being developed in the market by leading market players, in a bid to reduce operational and investment costs related to microalgae production. These new technologies are likely to be integrated with SME microalgae extraction and harvesting systems, helping these SMEs in addressing larger markets and expanding their businesses. Key companies profiled by the report, who support expansion of the global microalgae market, include Cyanotech Corporation, DIC Corporation, TerraVia Holdings, Inc., E.I.D.- Parry (India) Limited, Cellana, LLC, Fuqing King Dnarmsa Spirulina Co. Ltd, Algae.Tec Limited, and Taau Australia Pty Ltd.